This chapter is about the analysis with respect to the accommodation of wooden furniture inside a vehicle for their respective distribution, verifying the option of finding the correct stow model and accommodation maximum within the same, taking as a basis the traditional industry of furniture. Driving this problematic alluding to what is known as order picking takes into account the various restrictions in order to carry out a logical arrangement and awareness on the various care that must be carried out at the time of the handling of the same, all this with the aim of finding the best practices at the time of the mount of merchandise in the vehicle and the further optimization of space in the interior. With the help of software order picking algorithm visualization, it will display the virtual simulation associated with the improvement of material and products in a warehouse to display the form of accommodation of the goods within the container selected for the study. The management of a warehouse is a complex process that in turn comprises a good number of processes and activities typical of the logistics function that has evolved enormously in recent years. Continuous improvement that recurs costs and increases the productivity of the products. This management model is focused on the creation of flow to be able to deliver a maximum value to customers. It is essential to manage the resources of the warehouse, as units where a proposal is made, and to give possible solutions in the management of their processes, for which a record of information of a warehouse was made. For this, the order picking model was used, which is the selection of orders where you can define how they will be stored. Within the supply chain, logistics must move and position the inventory in order to meet the time, place and possession at lower costs. For there to be an interrelation between all functions must have a successful implementation among the five areas of logistic work (Inventories, Storage, Material handling, Packaging, Order processing). The processing of orders is a fundamental part of logistics management integrated, since not understanding the order will generate a distortion at the time of the operation. For that the revolution of information technology is present to achieve the management of any customer requirement. The supply chain is determined to work in a predictive way or reactive. If it is predictive, the design of the chain tends to be less important in accurate and timely information on customer's buying behavior. of the inventory management channels, which are decisive for the provision of services reliably adding value to the administration of inventories. 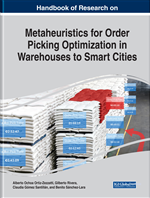 When considering that the Picking process (order allocation) is a determining process for the operation of the national distribution center in a Furniture Store, is considered an area quite susceptible and vulnerable since it rests all the responsibility of feeding the information system by means of the Earp (Seven) system by which the inventory of in general terms, being a manual process, the human factor has a considerable influence due to the logical aspects that can be presented in an operation such as: lack of concentration, omission, error in transcription among other aspects that directly affect the quality of the service and opportunity; causing with this on costs and reprocessing as a logistics inverse with quite a setback (manual) and other processes that involve moving merchandise one pharmacy to another (lack of opportunity).